I will also provide a compatibility CD that will allow the game to run under ALL VERSIONS of Windows 10, 8, 7, Vista and XP, both 32 and 64 bit. Note that network play no longer functions. 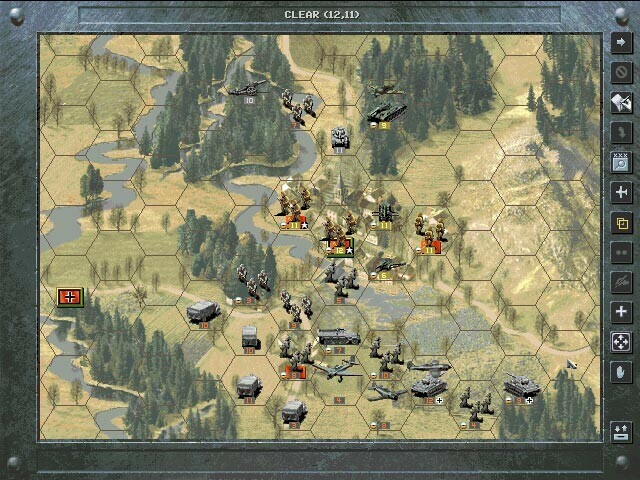 Panzer General II is divided into scenarios, each representing a specific battle. All are played on a hex map, which is divided up into hexagons that represent between one and two kilometers. At the beginning of the game, the entire map is revealed to the player, but enemy units are covered by fog of war and are not visible. Each hex is assigned one of thirteen terrain types that penalize or assist the movement of units. Mountain, city, and forest types block line of sight. The game also features four kinds of capatureable hexes marked a flag indicating the country owning it: ownership, designating a player's ownership of a city, town or other important feature; supply, allowing unit deployment; victory, indicating critical cities or objectives; and victory-supply, combining victory and supply. The objective is to defeat an enemy by capturing all of their victory hexes in a specified number of turns. The player attacks enemies and captures hexes by moving units, which approximately represent a battalion, regiment or squadron. There are eight types of units, each with different properties: Infantry, Tank, Anti-Tank, Recon, Air Defense, Fighter, Artillery, and Bomber. Each unit is assigned a numerical value to represent its movement (in hexes); its line of sight (in hexes); its attack abilities against armored targets, unarmored targets, ships, and airplanes; its defense against ranged, close, and air attacks; as well as a values for initiative and remaining ammunition and fuel. The final value, health, is represented by a fraction, usually out of 10. When attacking or defending, the unit receives experience points based on the amount of damage inflicted to its enemy. Each 100 experience points correspond to one experience level (a value ranging from 0 to 5). When attaining a higher level, unit may also receive a famous leader, granting it some special abilities. The in-game currency used to measure unit buy and upgrade costs is called "prestige". It is gained by capturing scenario objectives or as a reward for a quick and decisive victory. The standard game contains many real life scenarios; however, similarly to other games of the series, players will be able to play some hypothetical scenarios if they perform exceptionally in their command career. For example, Germany can invade and capture the British Isles by capturing Windsor or they can invade Malta with Italy. Again, if the player attains victories in the east and defeats the Soviet Union, Germany can invade the United States from the Port of Savannah and then march to Oak Ridge, Tennessee to capture a prototype of a US atomic bomb.